Chambersburg Civil War Seminars and Tours donated $6,500 for battlefield preservation on Oct. 2, presenting $5,000 to Antietam National Battlefield and $1,500 to the Save Historic Antietam Foundation. The Greater Chambersburg Chamber of Commerce offers the seminars with co-founder Ted Alexander. The money was raised through the auction of Civil War books and other memorabilia at a July seminar about the Battle of Antietam, as well as other fundraising efforts, according to a news release. Brian Baracz, park ranger at Antietam National Battlefield, said the money will be used for projects such as the restoration of the Miller House and wood lots in the East Woods, and re-establishing historic fence lines. 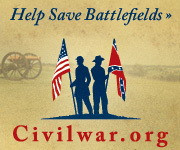 The seminars have raised more than $150,000 for battlefield preservation since their inception in 1989, and have attracted thousands of tourists from throughout the United States, Canada and other nations, the news release stated. In the past decade, other recipients of preservation funds include Friends of the Monterey Pass Battlefield Inc., Gettysburg (Pa.) Foundation/Museum and Visitor Center, Gettysburg Battlefield Preservation Association, Adams County Historical Society, Civil War Preservation Trust, Western Pennsylvania Conservancy, Shenandoah Battlefield Association, Sons of Confederate Veterans, Museum of the Confederacy, Brandy Station Foundation, Falling Waters Battlefield Association, National Firearms Museum and National Museum of Civil War Medicine. Impressive totals – $150,00 in just over two decades of work. The projects this money is earmarked for, according to the article, are not the staple grass and dirt targets typically seen for preservation efforts. Instead the intent is to use funds to enhance the existing battlefield. Such projects re increasingly popular as we “sesquicentennialists” look for “fourth-dimensional” connections. “Gettysburg and Beyond,” July 23 to 28, with historians Ed Bearss, Jeffry Wert, Lance Herdegen, Richard Sommers, J.D. Petruzzi, Dennis Frye and others. Tours include Pickett’s Charge, the Iron Brigade at Gettysburg, the Texas Brigade, Civilian Gettysburg, off-the-beaten-path sites, Early’s advance to the Susquehanna, the retreat and the Battle of Monterey Pass. “The Cavalry at Gettysburg,” Oct. 4 to 6, with historians Ed Bearss, Eric Wittenberg, Jeffry Wert and others. Tours include the east cavalry field, Farnsworth’s attack and Buford’s cavalry. For more information see the Chambersburg Civil War Seminars website or call 717-264-7101.